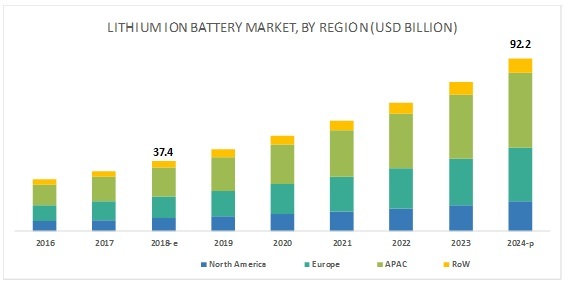 [172 Pages Report] The overall lithium ion battery market is expected to grow from USD 37.4 billion in 2018 to USD 92.2 billion by 2024, at a CAGR of 16.2%. The growth of this market is being fueled by increase in demand for plug-in vehicles, growing need for automation and battery-operated material-handling equipment in industries, growing demand for smart devices and other industrial goods, and high requirement of lithium-ion batteries for industrial applications. The energy density of NMC batteries is its primary strength. It achieves this energy density with good stability due to the use of an optimum ratio of nickel manganese and cobalt. It also has a good charge and discharge cycle. These features enable its application in industries such as automotive. NMC is used in batteries laptops, mobile phones, tablets, automotive, power tools, and electrical storage systems. It is expected to gradually replace LCO and NCA cathode materials in batteries of notebooks, mobile phones, and tablets. It is lightweight and can better serve slimmer and lighter tablets and smartphones. NMC is also used in HEV, EV, and PHEV as it offers higher safety, along with other desired properties. These advantageous properties of NMC are expected to increase its market share in next five years and ideally positioned it to be the best material available in this industry. Lithium-ion battery’s heavy power capacity makes it useful in electrical vehicles and industrial uses. The increasing market of consumer electronics and smartphones has increased the need for batteries with high power capacity that can keep the device running for long hours and at the same time giving an optimum experience of the device due to large screen and power back up service. Continuous development in consumer electronics as well as support from government and association for the adoption of lithium ion batteries has boosted the growth of this market. The growing use of electronic devices such as cell phones, laptops, MP3 players, and GPS navigation systems is driving the growth of the consumer electronics industry for the lithium ion battery market. The market mainly comprises China and India, which have a huge potential for many application areas within the lithium ion battery market. China being a global automotive manufacturing hub holds immense potential for the growth of the market. Increase in the production of electric vehicles and lithium ion batteries used in vehicles is driving the market in China. Furthermore, China is also one of the world's leading producers of electronic devices. This is expected to drive the lithium ion battery market across multiple applications in China. 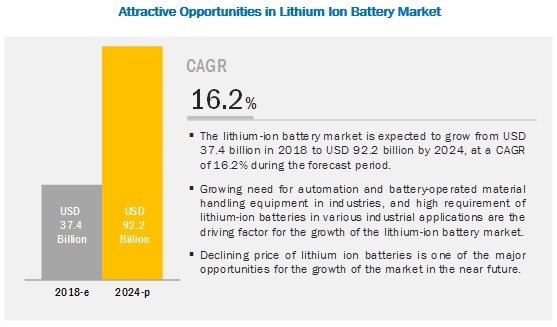 Also, the presence of a number of electronic manufacturers such as Panasonic (Japan), Sony Corp. (Japan), Samsung SDI (South Korea), and LG Electronics (South Korea) in the region is one of the key factors driving the market for lithium ion batteries in APAC. Some major companies operating in the global lithium ion battery market are BYD Company (China), LG Chem (South Korea), Panasonic (Japan), Samsung SDI (South Korea), BAK Group (China), GS Yuasa (Japan), Hitachi (Japan), Johnson Controls (Ireland), Toshiba (Japan), Lithium Werks (The Netherlands), CALB (China), Saft Groupe, (France), VARTA Storage (Germany), Farasis Energy (California), and Sila Nanotechnologies (California). LG Chem has an energy solution division that works on developing differentiated materials for automotive and mobile batteries with integration of the latest technology. Under its energy solution segment, it provides mobile batteries, automotive batteries, and energy storage systems. Under its mobile batteries division, it delivers cylindrical, prismatic, polymer batteries for mobile devices, electric tools, electric bicycles, and smart watches. LG Chem plans to build a 41,300 m2 sized production base in Wroclaw, Poland, by investing USD 380 million in its Polish subsidiary, LG Chem Wroclaw Energy. After the completion of production base in 2018, it will have capacity to supply lithium-ion batteries for 100,000 electric vehicles every year resulting into the production capacity for 280,000 electronic vehicles by leveraging company’s production system (Korea, US, China, and Poland). Panasonic Corporation undertakes various strategic investments, which sum up around 1 trillion Yen (~USD 9 billion), and has spent part of this total since FY 2016 to achieve sustainable growth in sales and profit. In FY 2018, the company’s lithium-ion battery plant commenced operation inside Tesla’s Gigafactory in the US. The company’s plant is in charge of producing the high performance cylindrical “2170 cell” used in Tesla’s new model 3 electric vehicles and energy storage system. The company is planning to continue investing capital in FY 2019 to achieve annual production capacity of 35 GWh. In July 2018, BYD Company signed strategic cooperation agreement with Changan Automobile to jointly manufacture batteries for electric vehicles. The groundbreaking agreement will see both companies collaborate in the production and sale of these batteries through a new legal entity based in Chongqing, a mega city of 33 million people in central China. In September 2017, Panasonic Corporation has decided to start the production of automotive lithium-ion batteries at a factory in Himeji, Hyogo Prefecture, and expanding domestic production amid increasing demand for such batteries. What are the upcoming products and technologies in the lithium ion battery market? Who are the key players and what are the strategies adopted by them? What are the fastest- or highest-growing areas in the lithium ion battery market? What are major drivers, restraints, opportunities, and challenges pertaining to the lithium ion battery market? 11.2.1.1 to Meet the Need for Power Supply to Complex Smart Phone Devices, Manufacturers Depend on High-Power Lithium Ion Batteries. 11.4.2.1 Lithium Ion Batteries are Used in Equipment Like Handheld Radios, Thermal Imaging and Tactical in the Defense Industry. The study has involved 4 major activities to estimate the current market for lithium ion batteries. Exhaustive secondary research has been conducted to collect information on the market, peer market, and parent market. Validation of these findings and assumptions with industry experts across the value chain through primary research has been the next step. Both top-down and bottom-up approaches have been employed to estimate the complete market size. After that, market breakdown and data triangulation procedures have been used to estimate the market size of each segment and subsegment. In the secondary research process, various secondary sources such as Hoovers, Bloomberg BusinessWeek, and Dun & Bradstreet have been referred to for identifying and collecting information for this study. Secondary sources included annual reports, press releases, and investor presentations of companies, white papers, certified publications, articles by recognized authors, gold standard and silver standard websites, regulatory bodies, trade directories, and databases. 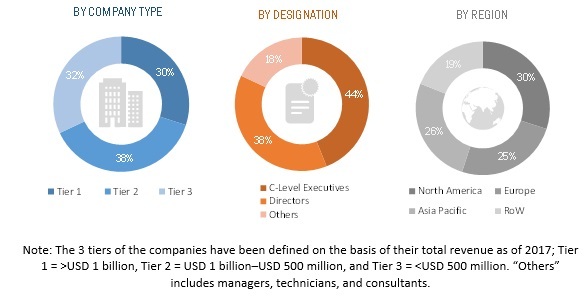 The lithium ion battery market comprises several stakeholders such as automotive consultants, consumer electronics manufacturers, lithium-ion battery distributors and providers, lithium-ion battery manufacturing companies, research organizations and consulting companies, and technology investors. The demand side of this market is characterized by automotive, consumer electronics, industrial sector, healthcare, and marine. The supply side is characterized by component suppliers, system integrators, and end-to-end solution providers. Various primary sources from both the supply and demand sides of the market have been interviewed to obtain qualitative and quantitative information. The breakdown of primary respondents is as follows. This research report categorizes the lithium ion battery market based on type, power capacity, industry, and region.